Sanya Malhotra has not just proved her acting prowess but keeps on giving her fans a glimpse of her dancing skills. We have seen how much this trained dancer loves to groove and in the latest video, she is seen teaming up with the original Gully Boy Naezy The Baa. 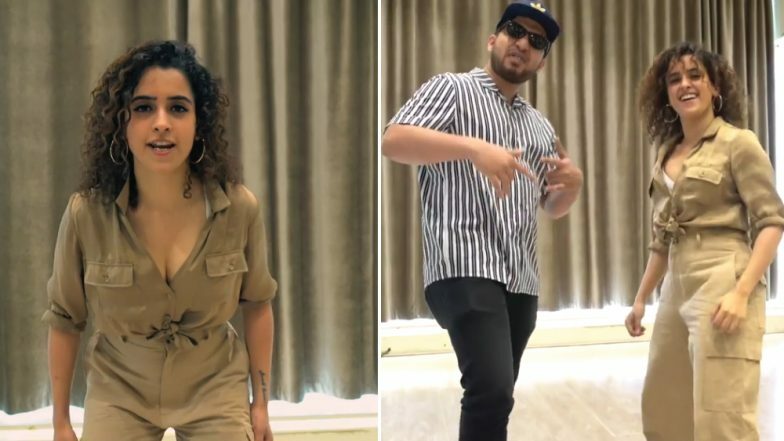 Naved Sheikh, better known as Naezy has made people's foot tap all the time with his raps and now even Sanya Malhotra couldn't help but groove to his newest song. In the video which she shared on Instagram, she is seen dancing to Naezy's latest track Aafat Wapas and the video has created waves on the internet. People are absolutely loving the dance video and has made them all go, "Bohot Hard, Bohot Hard!" After Dangal, Badhaai Ho and Photograph, Sanya Malhotra Signs Her Next Project With Aditya Roy Kapur - Read Details. The Dangal actress time and again shares her dance videos and there is no doubt of her dancing skills. What makes the latest one extra special, is when Naezy also joins along to croon the lyrics of his new song. The two continue to groove in the end of the video. Dressed in Khaki cargo pants and shirt, Sanya starts dancing to match the beats like no one's watching and it will definitely leave you spellbound. Diet Sabya Calls Sanya Malhotra's Polka-Dotted Jumpsuit 'Gandi Copy' But the Actress Has a Fitting Reply for Them! The video has impressed the fans of both the actress and the rapper so much so that it soon began trending on social media. Aafat was the first track by Naezy which was loved by everyone and went viral. This latest track is the second part of the famous song and needless to say, with Sanya Malhotra grooving to it, it has already got all the hits and love.